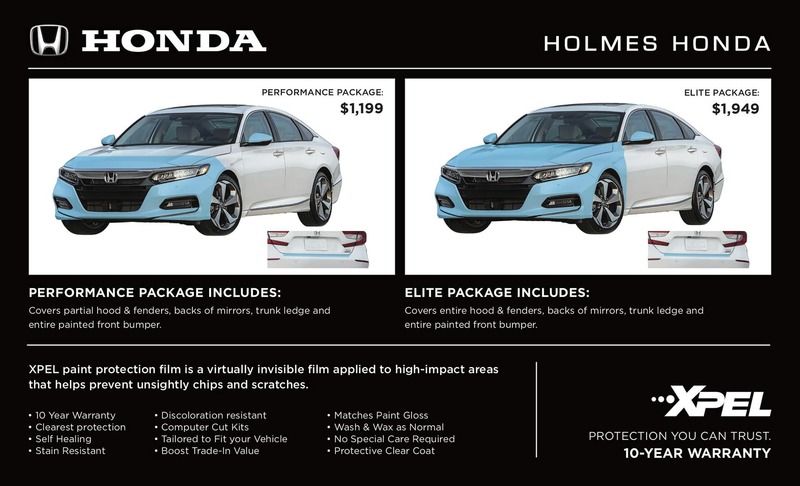 Holmes Honda‘s Service Department is eager to help you protect your investment with our top of the line XPEL Ultimate Paint Protection Film! See what this self-healing technology can do for your vehicle. Paint protection films are clear or colored polyurethane films that are applied to vehicles to protect them from scratches, dents, or swirls caused by road debris, rocks, bug droppings and other environmental elements. XPEL’s entire line of films are hand drawn, measured, and tested manually. Their ULTIMATE line uses special elastomeric polymer technology that allows the film to HEAL ITSELF from scratches or swirl marks in a matter of minutes. XPEL developed their Design Access Program (DAP) Software to provide the most precise and customizable coverage in the industry. You can also feel at ease knowing that our workmanship is backed by an extensive 10 year warranty! Are you interested in protecting your investment with XPEL Paint Protection? You can contact us by calling 318-212-1200, or visit us at 1331 E. Bert Kouns Industrial Loop. You can also contact our Service Department by filling out the short form below!